From Hancock: Drive north on US 41 toward Calumet. As you enter the outskirts of Calumet, look ahead for the prominent Keweenaw Visitor’s Bureau building on the right. When this building is in sight but before reaching it, turn left onto Agent Street. Agent Street becomes Swedetown Road after a slight bend. At the next T-intersection, turn right on Osceola Street. Look for tall Swedetown Recreation Area sign and driveway at 56641 Osceola Road. There are over 100K of groomed ski trails and miles of hiking and mountain biking trails. Some highlights – Michigan Tech Nordic Training and Recreational Forest has 35 km of groomed ski trails and mountain biking trails with structures for the adventurous. Nara Nature Park in Houghton has skiing and hiking trails with a chalet with fireplace and showers. 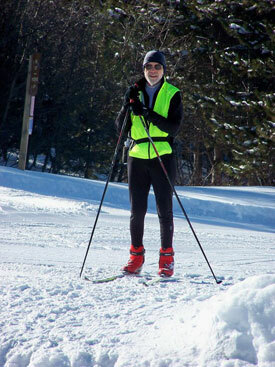 Chassell Classic Ski Trail has 10 km of quiet trails, winter grooming for classic striding only. The Maasto Hiihto/Churning Rapids system has miles of mountain bike trails to explore in summer. The area includes the beautiful Swedetown Creek gorge. Winter ski trail grooming provides 25K of trails groomed for classic striding. Snow bikes, dogs and snowshoeing are also welcome on all trails and there are extensive groomed snowbike trails. Copper Harbor Nordic Ski Trails has groomed ski trails starting at the Copper Harbor Community Center on U.S. 41. Trails in Eagle Harbor and McLain State Park have wonderful Lake Superior views.